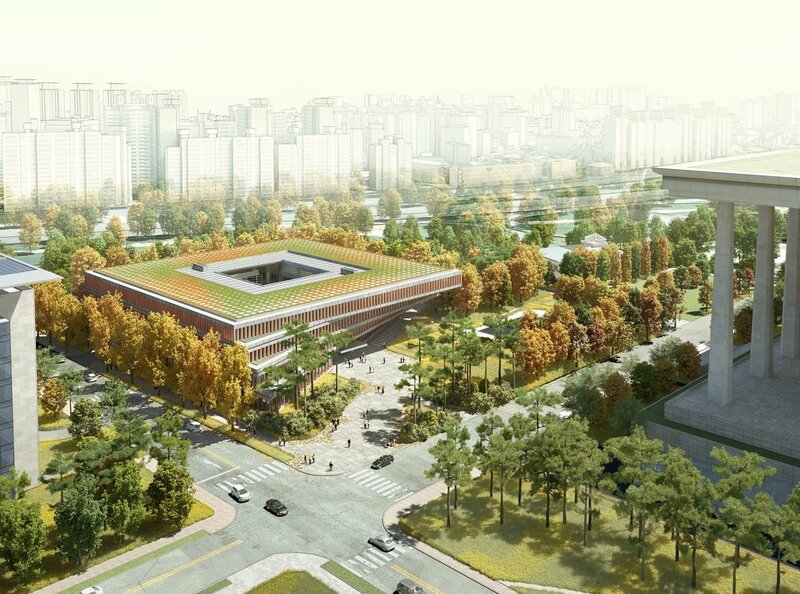 H Architecture in collaboration with Haeahn Architecture in South Korea, recently won the nationwide competition to design the new Smart Work Center and Press Center that will reside adjacent to the National Assembly Building. The project is located on the historical field of the National Assembly Complex in Yeoido, the largest island that is situated on the Han River in Seoul. As part of a long-term development of the National Assembly Complex master plan that began in 1969, the purpose of the new annex building is to support legislative functions of the National Assembly. The project site is approximately 20,600 m² and is located alongside the National Assembly Proceeding Hall (the main building) as well as the office building for the Members of National Assembly. The complex nature of the building program requires the flexibility of use so that it may function interchangeably as the spaces will be occupied by various groups of users. The building size is approximately 23,750 m² and will house five distinctive programs: a press center with a briefing room alongside a small broadcast facility with a workplace for reporters; a highly-equipped smart work center which serves as a remote workplace for commuting officers and Ministers from the government; supplementary office spaces; underground parking; and welfare facilities which will include a restaurant, a banquet hall and a retail component that will be accessible to both government workers and the general public. It is envisioned that the new building is to coalesce with the soft landscape and rigid master plan to promote a sense of public space and yet coincide with its identity as a monumental figure as opposed to it being a mere appendage to the main building. The interior planning of the workplace integrates traditional and progressive methods of layouts that are to ensure connectivity amongst the multiple groups of users as well as to stimulate interaction between them in a secured government building. The workplace is optimized to incorporate state-of-the-art workplace organization, and flexible space opportunities. Located on the edge of the Han River, the physical attributes of the site are likened to that of a public park. This characteristic is in contrast to the surrounding public spaces within the complex. Therefore, the site serves as an intimate gathering spot and resting place that is planted with a plenty of tall trees and greeneries alongside a parking lot. A few of the great outcomes of this preserved lush landscape is a panoramic view towards the Han River in addition to a scenic view from the river looking onto the National Assembly Complex of the symbolic field of Democracy. The innovative architectural design preserves the park-like site conditions by intentionally keeping the building height to a minimum. Thus allowing for the building to be submerged within the trees so that there would be un-obstructive views to the National Assembly’s main building. The building resides on the southern most portion of the site in order to allow the existing trees to remain and create more green spaces, thus enabling users throughout the complex to enjoy and utilize the green space and experience the natural conditions of the site. The overall building height is maintained as low as possible and the form is stretched out horizontally to create a spatial intimacy below the tree lines as well as to celebrate the greenery by concealing the building mass within the trees. The squared roof correlated with the National Assembly‘s original master plan, and the oscillation of the floor plates are gradually transformed into a stepped-trapezoid at the building footprint. It leads the building shape to a dramatic canopy and it eventually retains a formal identity in the complex. These qualities allow for interactive in-between programmed spaces and landscape gardens to emerge and together they create spaces where an array of dynamic activities may occur. The program within the building is stacked by function as each floor consists of different users. It is imperative to note that the building be secured while it operates and opens to the public. The concept of “stacking the programs” offers not only to ensure different levels of security-separation between floors, it also creates a hierarchy of secured programs; less required security programs inhabiting the lower floors and programs which require maximum security located on the upper floors. Program placements and fit outs are strategized to maximize efficiency in the workplace in order that there is flexibility of use. The entrance of the building at the ground level celebrates a communal area for public use that houses a 1200-seat restaurant, a multi-purpose banquet hall, a gym, and retail spaces. The space proceeds to a courtyard with a mound at the garden then continues to another garden towards the end of the building. The circulation path allows for continual access to all public areas. On the floor above resides the Press Center with a 125-seat briefing room. Other secured workplaces including the Smart Work Center and supporting offices are planned in the subsequent floors. Each floor is equipped with four secured cores that minimize security checkpoints in order to maximize the public access at the ground level. A courtyard in the center of the building creates a community hub and all communal spaces including the entry hall, lounges, and rest areas are connected to it. Through these design strategies, the architectural solutions evoke a sense of “secured publicness” both physically and visually. The courtyard dedicates itself to creating an interactive work environment. It also supports sustainable values and allows for natural ventilation and workspaces to use natural daylight. The open and engaging landscape garden with restful groves of trees and a pond provides small and intimate spaces to gather and visit at all times of the day. The varied gardens will provide opportunities for impromptu meetings and events as well as flexible locations for other types of engagements between the users. The positioning of the building informs the nexus of positive communication, productive debating, and a promising future of the democracy in the years ahead. As the National Assembly enters its seventh decade, the new Smart Work Center and Press Center will be a place where the public will engage and interact with the national leaders and their visionary strategies.